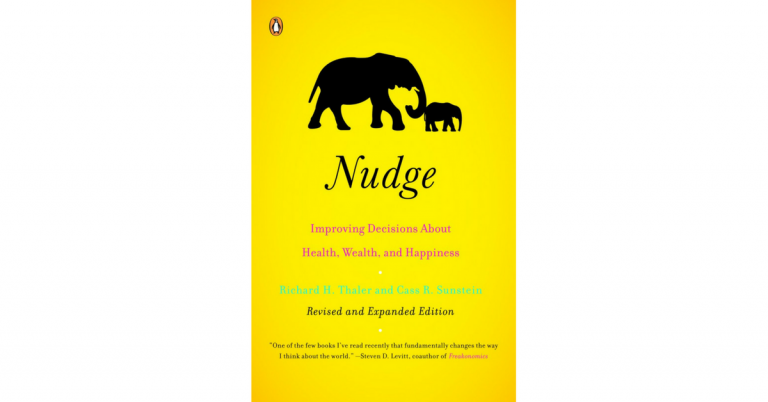 Nudge is a book for people who want to help –but not force– others to make better decisions. I first learned of this book when Daniel Kahneman raved about it in Thinking Fast and Slow. I was looking forward to Nudge and was not disappointed. I recommend it to anyone who might be presenting choices to others, and therefore affecting those choices. Nudge is about choice architecture: the ways that various factors in how a choice is presented may affect the decisions made by the chooser. The heart of the book can be summarized through a clever (if imperfect) mnemonic device: NUDGES. By using NUDGES, choice architects can be more effective at helping people to make better choices. For many excellent examples, from placement of food items in a cafeteria to software that makes you delay sending emails to that seem to be uncivil, read Nudge.